Someone who didn’t have a good mom – no placard, no license plate. Also, she drove in the “OUT” driveway. My mom has a handicapped placard for her car because she uses a wheelchair. The old one expired and she got the new one in the mail. “Can you put this in the car for me?” she asked. I busted up. I just couldn’t believe my mom was telling me this. I think that made her truly happy. I have an acquaintance who’s an amputee – a war veteran – and he has a handicap parking placard. But he is in pretty good shape, for that, and when he wears his prosthesis under trousers, he can walk OK. So one day he was parking in a handicap space and someone approached him and berated him for not being handicapped. He bent down and took off his leg. Was she speechless? Laughing hard cause you had the perfect answer. She honestly thought I might use it! We have a placard that we can use when we have the J-man with us. It’s not that all of us can’t walk, even long distances. It’s that the J-man is a “runner” – it means if we put him down in a parking lot, he freaks out (open spaces are very very very hard for him), and either runs or flops down – neither of which are safe, since it’s not like he has any idea of the danger of oncoming cars. So we carry him. And the shorter the distance you carry an almost 6-year-old the better, especially since he often freaks out anyway and fights you the entire time. We don’t use it if there are other, close, spaces… or obviously if the J-man isn’t with us! Oh, and because I’m longwinded… we also “get” to park in the handicapped spaces at school, because the J-man walks out to the car/into the school with a teacher holding his hand/arm, for the same reasons I stated above. I HATE the people who can’t be bothered to wait in the carpool lane, and so whip into a handicapped spot and let out their special snowflake, or “just run in a minute” to pick up said snowflake… while the parents of autistic kids try to keep their kids from getting hit by those people. 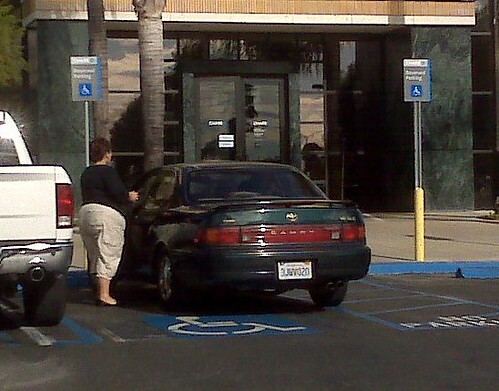 I do not use a handicapped placard without its person being in the car. On the other hand I’m not above inviting said person along on an errand when I’m feeling a bit lazy. S’s dad has terrible degenerative knee arthritis (his father had to have his leg amputated due to complications) and has a really hard time getting around some days. He sometimes uses the one that their aunt had before she passed away while she was living with/being cared for by them. I remember one of my hs classmates saying she would park in the expectant mother spots at the grocery store because she expected to be a mother some day. Yeesh! HA! In contrast I have a very able-bodied mom who gets in my car and dashes back out to grab the placard she keeps because of my dad (who’s not able-bodied) so she can try and make me use it to get a closer space. Please note: Dad is not with us on this trip. I say “no” and am declared uptight and…get this…inconsiderate. Your mom needs my mom to give her a talking-to. My mom was the same way. I would have a heart attack if I parked in a handi space while I was able bodied. I just could not do it. I do sometimes use the handicapped stall when I have one of my kids with me. I don’t think the handicapped stalls are reserved for the handicapped. Just provided for them if they need it. i don’t park in handicapped spots, ever. but i do like to use the handicapped bathrooms. does that make me a bad person? No! Though occasionally someone does write into dear Abby claiming that handicapped ppl should own handicapped bathroom stalls, I don’t agree. I mean, if someone has a walker or something, of course they should go first so they don’t have to stand so long, but otherwise I think it is grab whatever stall is free.